The year of 1957 has special significance for all Australians who have got to know and learn to love a breed of cat known as Burmese, for that was the time that the first two Burmese arrived in Sydney, Australia. Champion Tomahawk arrived by ship in August 1957 aged 14 months. He was owned by a syndicate of four breeders, Mrs. Helham (Talbingo), Mrs. Willington (Farida), Mrs. Whatley (Goldfinders) and Mr. Allen (Amherst). Calypso Pallas Athene, aged 6 months, arrived in November 1957. 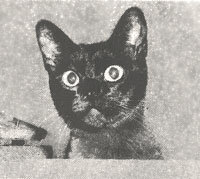 Tomahawk arrived to a welcome of an ABC television sequence introducing a programme on the Sydney animal quarantine station; both had press coverage and the Sydney Morning Herald in their retrospect of Events or 1957 made mention of these two important additions to the Australian cat world. Australia's first Burmese, Tomahawk, was the brother of Paquita, who with Merrick Apollo and Nilgiris Buru Kanhai, were the first three Burmese imported in 1956 to New Zealand. These cats were the parents to the next imports to Australia. In 1958 three cats from the Ransein prefix of Mrs. Sedcole and her son Hayden Pollock, were imported. These being Ransein Hydaji (Ch Merrick Apollo x Ch Nilgiris Buru Kailhau) and Ransein Fu-Yen (Ch Merrick Apollo x Paquita) to Mrs. Abbott (Eastern prefix) of Sydney and Ransein La Rue (Ch Merrick Apollo x Ch Nilgiris Buru Kanhai) to Mrs. Henry (Coochie) in Brisbane. Mrs Esme Henry (Coochie) was the first judge to own Burmese in Australia. Mrs. Henry produced many of the early Burmese that have been photographed and was a major influence on the breed. Coochie Anouk was the first Burmese in Victoria. Anouk was well known for his close friendship with the second blue Burmese bred in Australia, CC Mimboo Lucifer. Anouk and Lucifer were the first Burmese studs in Australia that lived happily together. 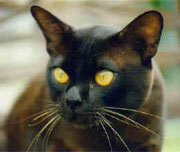 In 1962 at the Federal Cat Show, three brown Burmese cats were shown. They were Tomahawk, Calypso Pallas Athene, and Ransein Chindet. Ransein Chindet won Best Exhibit that year at the Royal Easter Show. In 1967, Cordon Williams who thought these Beautiful cats had not received the recognition they so richly deserved founded the Burmese Cat Society of Australasia. "She was much lighter than the others, almost a pale fawn. At about six weeks of age, she started to develop darker ears, nose, mouth and paws, and these turned to the brown of the other kittens. Her eyes would perhaps best be described as very pale lemon. She is Burmese in style, temperament and action ... her mask was dark, but only the dark mask common to Burmese." In 1974, Kerrya Krema Tarari was born in West Australia. She would later become NSW first cream Burmese female cat. "All restriction on the awarding of challenges for the new coloured Burmese, Lilac and Champagne will be lifted. This means that any cat, male or female, that measures up to the required standard shall be eligible for a challenge irrespective of numbers present." In 1978 the first chocolate tortoiseshell Burmese were born, followed in 1979 by two lilac creams to breeder Linda Lalley Day (Sadoo). From 1st January 1982 the chocolate tortoiseshell and lilac cream were removed from provisional register and were allowed to be awarded challenges in NSW. This was due to the unfailing efforts of Mick Paterson who continuously encouraged other breeders to put them on the bench. In 1984 the revised standard of Burmese was approved. This had been initiated and reviewed for a number of years. It is the current standard today. On 11th March 1989 the Burmese Advisory Committee held its inaugural meeting. This committee was to achieve the recognition of all four colours of tortoiseshell Burmese as tortoiseshell in their own right. With forty years of Burmese in Australia, certainly there will be another ten making for 50 years. But wouldn't it be great to imagine celebrating the Centennial of Burmese in the year 2057. With the efforts of all Burmese breeders and those wonderful cats we are certain that we can achieve this immortality.